What if I told you there was a matchup on the Sunday NFL card where you could take a touchdown with a home team that had won eight of their last 10 home games, had the superior defense with maximum motivation going and was facing an opponent who has yet to look good on the road. I am – even though it means going against the Patriots. That’s the story with Tennessee hosting New England. The Titans are 8-2 SU, 7-2-1 ATS in their last 10 games at Nissan Stadium, which is one of the more underrated strong home fields. The Patriots have done little in their road matchups. They lost by double-digits to the Jaguars and Lions in their first two road games. New England was outgained and needed two touchdowns that didn’t come from its offense to subdue the Bears in Chicago, 38-31, and only managed one touchdown on offense to beat the Bills, 25-6, in their last away contest. he Titans are going to be sky-high for this matchup. 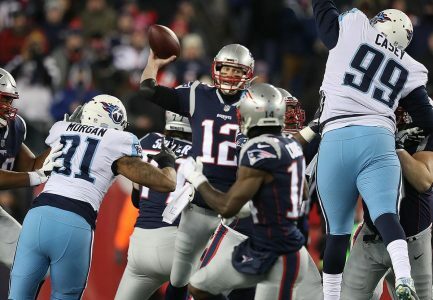 Not only do they have playoff revenge, but the Titans feature a number of former Patriots. The list includes running back Dion Lewis, cornerbacks Malcom Butler and Logan Ryan along with defensive coordinator Dean Pees and head coach Mike Vrabel, a longtime player and linebacker coach for Bill Belichick. Even though this is a non-division game, the Titans are going to know the Patriots extremely well. From a matchup standpoint, the Titans offense has picked up since Marcus Mariota discarded a glove he had to wear on his throwing hand. A healthy Mariota accounted for three touchdowns and a season-high 119.9 passer rating in the Titans’ 28-14 road win against the Cowboys this past Monday. The Patriots rank third-from-the-bottom in sacks and are 26th in pass defense. By contrast, the Titans give up the fewest points per game in the NFL at 17.6. The Titans don’t reside in the Patriot League, I mean AFC East Division either. New England’s offense hasn’t been at full strength with both Rob Gronkowski, its top receiving threat, and Sony Michel, its best runner, both missing last week. Each is questionable for Sunday. I’m not in the habit of fading the Patriots, but this is the matchup and spot to do it. (Editor’s note: Stephen Nover is one of the top football handicappers in the country and he’s proving it again this season going 45-24 on his premium/free college football plays since September and 38-26-3 on his NFL premium/free plays this season. Stephen has five premium Sunday NFL plays in addition to this free selection headed by his November Total of the Month.